Avoid hitting potholes, as they can cause severe damage. As the snow melts, be aware of potholes. 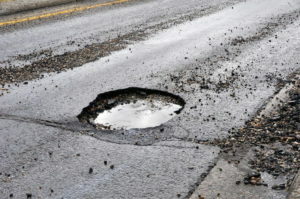 Hitting potholes can cause suspension damage like a broken ball joint or blown strut. It can also cause the suspension to have issues as you drive. Sometimes you will hit a pothole hard enough you will need an alignment. An alignment is and adjustment of the suspension system of the vehicle. This is the system that connects the car to its wheels. If the alignment is off, you can get uneven and premature tire wear. It can also pull to one side while you are driving. You will also want to check the tires if you hit a pothole. There could also be tire damage. Don’t just visual check the exterior, look on the inside of the tire that you can’t see by just standing there. You might get a bulge on the tire from a tear in the inside lining. When you run your hand along the sidewall, you can feel it. Even if you do not see damage, you should bring it in and have the alignment checked. The best protection against potholes is properly inflated tires. Look in the manual or driver’s doorjamb to find the correct pressure. The number on the side of the tires is the maximum recommended by the tire manufacturer. Also make sure to check the tire pressure regularly. Spring is pothole season, so you should be aware of the road you are driving on. Usually these are formed at the edge or center of the road. Also make sure to be cautious of puddles. These could be hiding a pothole. Since it will be filled with water, you will not know how did that pothole is. If you do hit a pothole, be aware of how your vehicle handles. Any odd ways how your vehicle handles should be a cause for concern. Bring the vehicle in, and we can inspect it for you. This way you can ensure a comfortable ride.